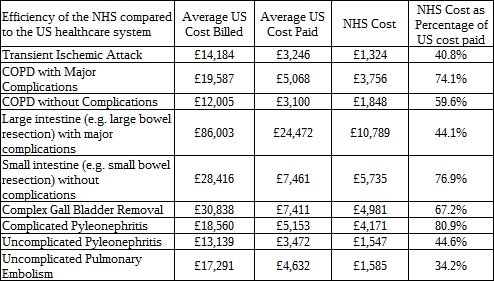 In my last post about healthcare costs I compared the amount spent under the British system to bills from the American system, and it was far my most popular post so far. One of the most popular questions was about costs by procedure or condition, something which lead me to do a little research as last time I checked the American data simply wasn’t available – it now is. 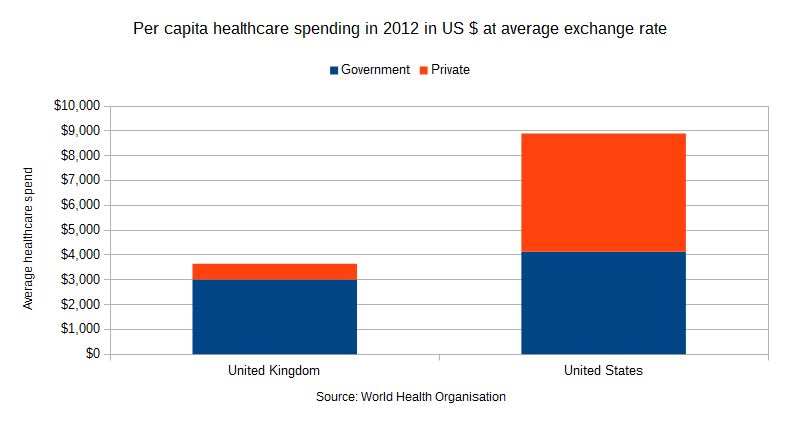 We can compare the overall spend by using World Health Organisation data for 2012 the British Government spent $3009 per head out of a total British spend of $3648/head. The American government spent $4126 out of a total of $8895. So in America you are taxed more for healthcare than you are in Britain. As an aside the over 65s make up 46% of the NHS inpatient spend – throw in the expensive Renal patients that are also in Medicare, military veterans (not a cheap group to treat), and add Medicaid, and the US government is more than pulling its weight when compared to the American private sector. As a rule the insurance companies take the young and the fit. The American data includes two different amounts; the amount the hospital bills and the amount average it receives. And for comparison I’ve included both; American healthcare isn’t quite as overpriced as the previous bills I posted indicated. Insurance companies have professional negotiators who know all the tricks, meaning that the full price is most likely to apply to those who don’t have experts to speak for them. In the wonk post I gave my workings – but for every British HRG I was able to match up to one of the top 100 American DRGs, the NHS cost was between 34% and 81% of the American price. So we pay less in taxes than the Americans do for our healthcare, according to the Commonwealth Fund our healthcare system is outstanding, and condition or procedure by condition or procedure we’re significantly cheaper. For people interested in why this is the case, I’ve looked at the incentives in a previous post. This entry was posted in Corruption, Healthcare and tagged ethics, nhs by Francis. Bookmark the permalink.